This paper examines the macroeconomic rebound effect for the global economy arising from energy-efficiency policies. Such policies are expected to be a leading component of climate policy portfolios being proposed and adopted in order to achieve climate stabilisation targets for 2020, 2030 and 2050, such as the G8 50% reduction target by 2050. We apply the global “New Economics” or Post Keynesian model E3MG, developing the version reported in IPCC AR4 WG3. The rebound effect refers to the idea that some or all of the expected reductions in energy consumption as a result of energy-efficiency improvements are offset by an increasing demand for energy services, arising from reductions in the effective price of energy services resulting from those improvements. 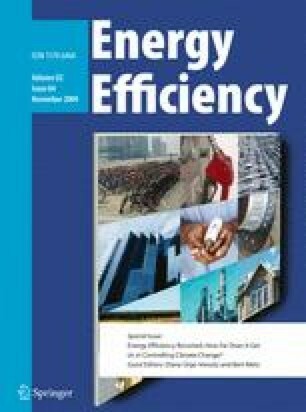 As policies to stimulate energy-efficiency improvements are a key part of climate-change policies, the likely magnitude of any rebound effect is of great importance to assessing the effectiveness of those policies. The literature distinguishes three types of rebound effect from energy-efficiency improvements: direct, indirect and economy-wide. The macroeconomic rebound effect, which is the focus of this paper, is the combination of the indirect and economy-wide effects. Estimates of the effects of no-regrets efficiency policies are reported by the International Energy Agency in World Energy Outlook, 2006, and synthesised in the IPCC AR4 WG3 report. We analyse policies for the transport, residential and services buildings and industrial sectors of the economy for the post-2012 period, 2013–2030. The estimated direct rebound effect, implicit in the IEA WEO/IPCC AR4 estimates, is treated as exogenous, based on estimates from the literature, globally about 10%. The total rebound effect, however, is 31% by 2020 rising to 52% by 2030. The total effect includes the direct effect and the effects of (1) the lower cost of energy on energy demand in the three broad sectors as well as of (2) the extra consumers’ expenditure from higher (implicit) real income and (3) the extra energy-efficiency investments. The rebound effects build up over time as the economic system adapts to the higher real incomes from the energy savings and the investments. This paper has been prepared as a contribution to the research of the UK Energy Research Centre and the UK Tyndall Centre for Climate Change Research. The authors are grateful for the support of the Centres and their funding from the UK Research Councils. Anderson, D., & Winne, S. (2004). 'Modelling innovation and threshold effects in climate change mitigation', Working Paper No. 59, Tyndall Centre for Climate Change Research. www.tyndall.ac.uk/publications/pub_list_2004.shtml. BERR ER (2006). Energy review. Overarching initial regulatory impact assessment, Department for Business & Regulatory Reform, http://www.berr.gov.uk/files/file32177.pdf. BERR EWP (2007). Meeting the energy challenge. A white paper on energy, Department for Business & Regulatory Reform, http://www.berr.gov.uk/files/file39387.pdf. IPCC AR4. (2007). IPCC Fourth Assessment Report, http://www.ipcc.ch/.